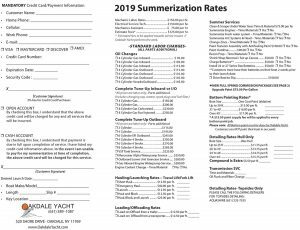 Below is our 2018 Summer Service Rate Card. 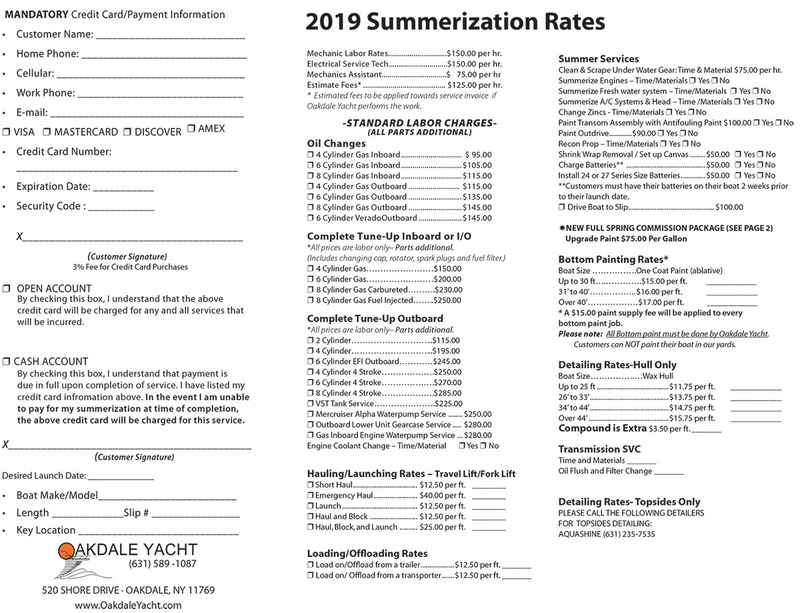 Please fill out ALL required information as well as the services you would like completed on your boat and your desired launch date. 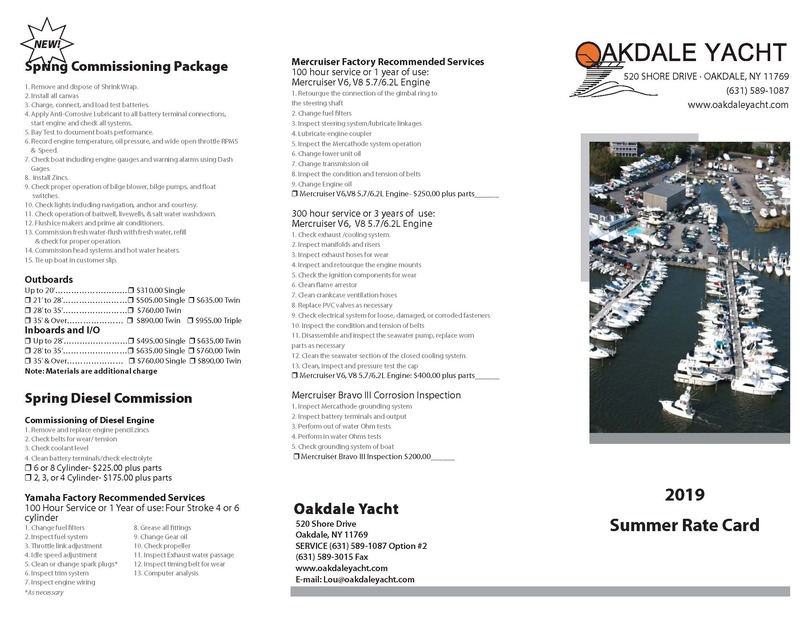 Please e-mail the completed form to Lou@oakdaleyacht.com or fax it to (631) 589-8900. Spring Launches Always Book Up Early Make Sure You Get On The List ASAP! Mechanic Labor Rates……………………………….$150.00 per hr. Electrical Service Tech……………………………….$150.00 per hr. Mechanics Assistant…………………………………$ 75.00 per hr. Estimate Fees* ……………………………………….. $125.00 per hr. 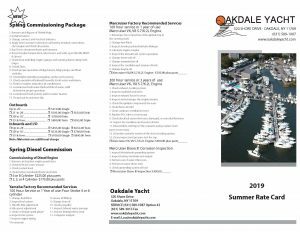 Oakdale Yacht Performs the Work. Short Haul…………………………………. $12.50 per ft. Emergency Haul………………………… $40.00 per ft. Haul and Block ………………………….. $12.00 per ft. Haul, Block, and Launch …………….. $25.00 per ft.
Load on/Offload from a Trailer……………….$12.50 per ft.
Load on/ Offload from a Transporter………$12.50 per ft.
Up to 30 ft….………….$15.00 per ft.
31’ to 40’…………….. $16.00 per ft.
* A $15.00 Paint Supply Fee Will Be Applied to Every Bottom Paint Job. Please note: All Bottom Paint Must be Done by Oakdale Yacht. Customers can NOT Paint Their Boat in Our Yards. Up to 25 ft …………………………………..$11.75 per ft.
26’ to 33’………………………………………$13.75 per ft.
34’ to 44’………………………………………$14.75 per ft. Compound is Extra $3.50 per ft.